When the city of New York seems to be caught in a supernatural explosion of biblical proportions, Mayor Lenny calls upon the Ghostbusters to save the city... and the lives of millions of registered voters. This figure really is only called "New York City Mayor." He had a name in the movie, you know! It was Lenny. And in the cartoon, his last name was "Clotch," though who knows how canonical that is. 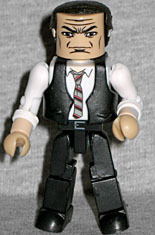 This is a great-looking Minimate copy of the character seen in the films: he's got his sleeves pushed up, which isn't quite right, but it suits him. His necktie is painted on his chest, and he gets a new vest. His face is terrific, and the likeness of David Margulies is brought to perfection by the "slightly balding" hair piece. Go mayor! The Subway Ghost appears in the same montage as the Zombie Taxi Driver - if you're ever in New York and want to see the entrance he came out of, it's City Hall Station on the N and R train. That's near the corner of Broadway and Murray, catty-corner from a Citibank. 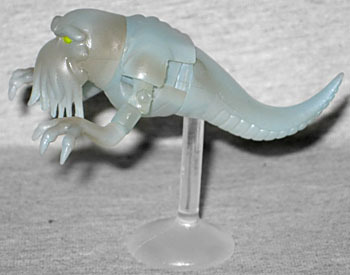 The ghost in the movie was basically just a head, tail and arms, and this toy tries to duplicate that. It's a horizontal monster, like the Terror Dogs, and in fact uses their chest cap. 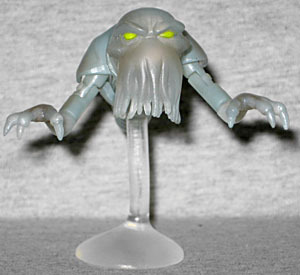 He's also got Killerwatt's hands, but instead of legs he's got a long tail, and his head has dangly tentacles in front of the mouth. The entire thing is a smoky, translucent plastic, but the flight stand is clear. The Subway ghost is cool, if not terribly memorable, but Mayor Lenny is the unexpected star here. I got the set on clearance, mostly for the ghost, which was just a fun design. Sadly, there's not all that much to DO with him, while the Mayor has become my default business casual body. ... for some reason I really enjoy putting Halo helmets on him.